When trying to eliminate wheat, it is really tempting to go straight to the wheat free version of things (bread, pasta, cookies, etc) but this isn't always the healthiest or the tastiest option. Plus, those replacements can make your grocery bill go through the roof. For these reasons and more, Nate and I have challenged ourselves to try and replace a lot of the highly processed carbs with hearty veggie alternatives. 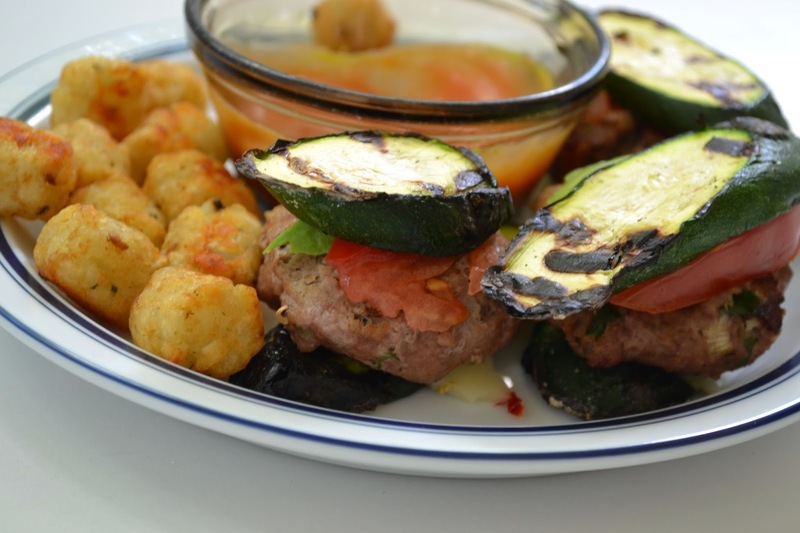 One of our favorites recently were these turkey burgers with zucchini buns. The inspiration for these came from Queen of Quinoa. She makes full size burgers on her site but I cannot find large zucchini's in Fl so I made sliders instead. To make the "buns" large enough, I cut them on the diagonal. What's great about this idea is you can be really creative. I put green onions, oregano, garlic, onion powder and garlic salt in my burgers and topped them with pepper jack cheese, tomato and avocado but you could do so many different combos to keep things interesting. And you know what? We like these better than burgers with regular buns. Every bite is so flavorful and there is nothing dry about these burgers!